Honda’s two-person and four-person 2014 Pioneer 700 and Pioneer 700-4 models commence a new assembly of side-by-side off-road machines in the Honda lineup. 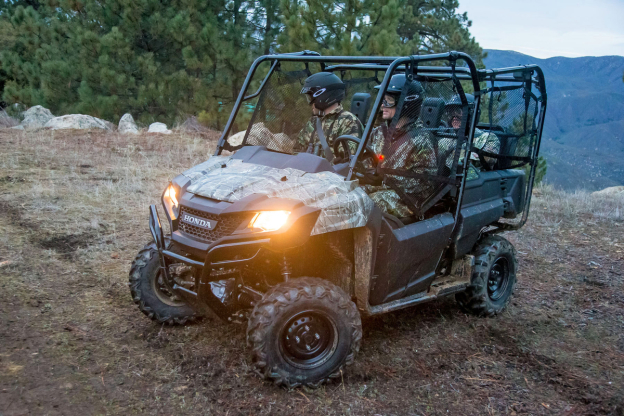 The Pioneer machines were designed by Honda Research and Development in Ohio and built at Honda South Carolina, to gratify the needs of off-road aficionados. The new Pioneer models supersede the esteemed Big Red and head the excitement for future Pioneer models. The Pioneer 700 and Pioneer 700-4 fall into the steadily growing multipurpose side-by-side category and easily outstand neighboring competitor’s quality and value with the Pioneer 700 starting at $9,999 and Pioneer 700-4 at $11,699. Honda’s development of the Pioneer models are powered by an all-new chassis built around the 700cc-class liquid-cooled OHV single-cylinder four-stroke engine with a distinctive automotive-style automatic transmission and integrated doors and headrests. The new chassis and design features a long-travel suspension configuration for a leveled ride over hard-hitting landscape, so riders can carry and tow heavy loads without apprehension. The Pioneer 700-4 includes a load carrying bed and convertible seating arrangement that can be swiftly and easily transformed from a two-seat to three- or four-seat arrangement without using tools. Depending on the carrying needs, the two rear seats lift from the bed by releasing the latch and locks into place, switching to a three or four seating arrangement with three-point seat belts available from above on the Roll Over Protection Structure (ROPS). Both Pioneer models are built with a sturdy steel frame and a wheelbase slight longer than the Big Red’s –76.8” vs. 75.7”- however the total length and width have been slightly reduced, making the Pioneer models more efficient with a 14.8” turning radius and 10.3” ground clearance. The new Pioneer additions distribute relaxed and coordinated double-wishbone independent front suspension system with 7.9” of travel and double-wishbone independent rear suspension system with 9.1” of travel with twin rear shocks adjustable for preload, creating exceptional off-road, carrying capabilities. The 2014 Pioneer models have new front tires sized at 35 x 8-12 for improved and responsive steering. Riders and passengers will also experience noticeably less engine vibration and an even ride with the innovative engine-mounting subframe and vibration-isolating bushings that better control the steering wheel, handholds, floor, seat bottom, and seat backs. A dual shift-mapping program is new to Honda’s Pioneer models, which automatically selects the Cruise or Sport transmission-shifting mode depending on the driver’s repetition of throttle operation. The Sport mode initiates and holds the transmission in gear longer before shifting to supply uncompromising performance when required. The Cruise mode permits the transmission to shift up earlier for prolonged limits and casual performance. The 2014 Pioneer models feature full-time 2WD to transfer the power into enhanced, terrain-grabbing traction. A new rear-wheel drive now integrates a non-differential rear end, delivering excellent drive features including a 4WD gearshift selector for rough areas and a front differential lock for maximum pull. The Pioneer’s tilt-bed is rated for a massive 1000-pound hauling capacity and a remarkable 1500-pound towing capacity, and includes multiple D-rings on the cargo’s wall and bed for accessible tie-down points. Honda’s Pioneer models have over 50 genuine and signature accessories, allowing owners to deck out their new Pioneer for individualized needs. The innovative Pioneer models embrace Honda’s unparalleled quality, and cater to the various demands of off-road recreational riders, hunters, outdoor families, job site employees, and everyone in between.